More than 1,000 properties were left without power during heavy rain and wind which brought flooding and travel disruption. Pembrokeshire and Carmarthenshire saw the worst of the weather with some homes in Milford Haven under 10ft (3m) of water. A Met Office warning to expect flooding was in force across the two counties until 23:00 GMT. Other parts of south and mid Wales were also "at risk" of flooding. Western Power Distribution has restored most of the outages but the rain has been the biggest problem. 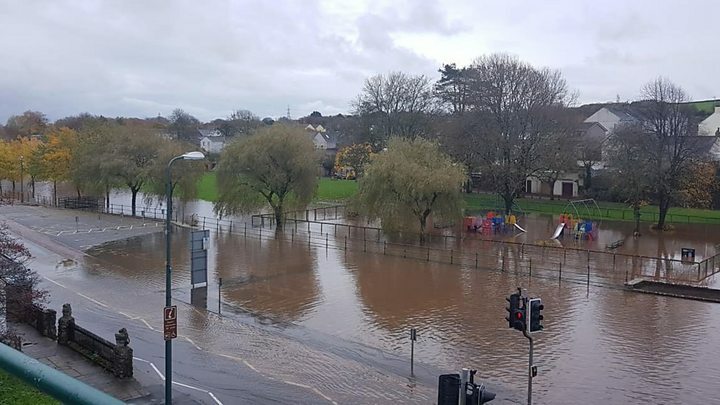 Pembrokeshire council said home owners and businesses in Haverfordwest town centre should prepare for possible flooding on Friday night, while Carmarthenshire council warned those in the St Clears area to be "particularly prepared". A number of roads were flooded including parts of the A40, which runs through both counties. It has flooded between Fishguard and Scleddau, and Llanddewi Velfrey and Penblewin. Taxis replaced trains between Haverfordwest and Milford Haven, while Traffic Wales reported people were evacuated from Lower Priory due to most roads being flooded. Natural Resources Wales said its teams were continuing to check flood defences while people have been told to take care near fast-flowing and swollen rivers and not to drive through flood water. Earlier on Friday, Milford Haven and Pembroke libraries were forced to close, along with a number of other commercial properties. Forecasters said up to 40mm (1.5in) of rain could fall within a six-to-nine hour period. The amber warning for heavy rain and wind was in place until 23:00, while a yellow warning covered the remainder of south Wales until midnight.